AlfaRichi software works on Android, Windows and Linux. AlfaRichi software works on all Android Tablets including the popular Samsung Galaxy tabs and Motorola XOOM tablets. For a fixed sales point we recommend 10.1″ tablets attached with the robust stands that we can supply. The tablets communicate using WIFI and can connect with either network or Bluetooth receipt printers. Cash drawers can be connected to the network printers. Please contact us for details about hardware compatibility. For mobile sales, either 10.1″ or smaller size tablets can be used. For taking orders at tables, 5″ or 6″ tablets are a good solution, as well as using Android smart phones. and promotional material (video or side show) when there is no sales in progress. in restaurants or for recording sales and payments for mobile deliveries. 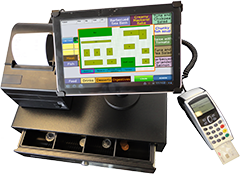 If you already have one or more Windows touch terminals, then contact us about installing AlfaRichi EPOS software. You can combine on the same site Windows Touch Terminals, Android tablets and Android smart phones, and all communicate with the same Cloud back office. AlfaRichi software works on selected touch terminals from J2 and other suppliers. 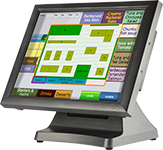 The most popular touch terminal supplied with Linux and AlfaRichi EPOS software is the J2-615 which is robust and reliable terminal. AlfaRichi software works with most STAR network and usb printers as well as with most serial receipt printers that use EPSON ESC/POS protocol. For mobile applications, AlfaRichi software works with DATECS and some other Bluetooth receipt printers. Please contact us for details about hardware compatibility. For Android, either Network or Bluetooth printers should be used. On touch terminals, most USB or serial link bar codes readers can be used. With Android tablets, we recommend Opticon USB bar code readers. AlfaRichi EPOS software on Windows or Linux communicates with CAS PD2 scales. For terminals with a serial link, AlfaRichi software communicates with selected INGENICO card readers. For Android tablets, links with Bluetooth card payment readers are planned. Please contact AlfaRichi for more details. If I already have hardware? If you already have an Android tablet or Smart phone you can subscribe to AlfaRichi software, download it and start using it. If you have a Windows Touch terminal, then contact us to get the Windows version.